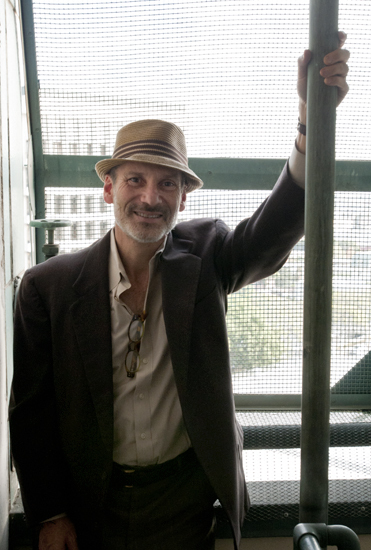 Learning Los Angeles: Aaron Paley Founder of CicLAvia, "I'm So Excited About Living Here!" Aaron Paley of CicLAvia is a San Fernando Valley kid who knew there was more to LA than his suburban neighborhood. He grew up organizing family festivals across the city. 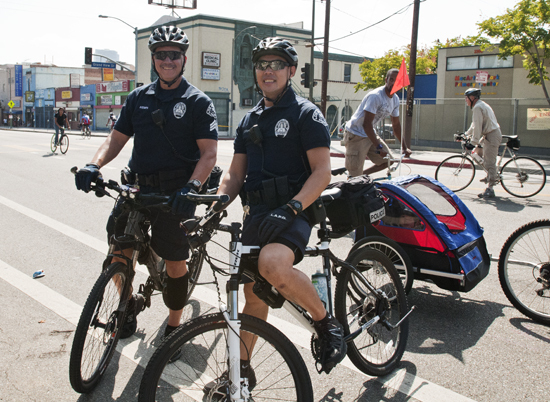 CicLAvia is now a city-wide festival, closing streets so that residents can ride bicycles safely throughout the city. 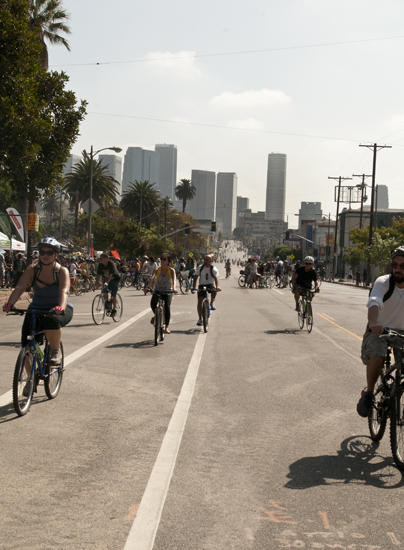 The next CicLAvia is April 6, and includes a route along iconic Wilshire Boulevard. Q: What is the value of a public space? A: Public space is what makes a city. A good public space is where different people feel comfortable -- single woman, the homeless, the elderly, children. I wanted to design a space where you have effectively broken down the barriers people bring, and you enable people to meet and engage with each other and the city, breaking out of their autonomy. That's the genius of cities, people get to have chance encounters and experience things beyond their worlds. A good festival helps us have fun, even though we may not be with the people we see in our daily lives. If you just move from your house to your car to your office to a restaurant, you never experience public space. Q: What inspired you to pursue public spaces for Angelenos to enjoy? A: I love architecture and urban planning. I'm not an architect, but it's been my obsession, the design of space and cities since I was a little boy. The thing that was exciting about LA to me as a boy was the different public neighborhoods -- downtown, Venice Beach, Disneyland, Hollywood Boulevard. All these places were amazing. ariellbphoto.com This is genius, take over the streets! Q: Tell us what you learned living in other cities? A: I traveled and lived in New York, San Francisco, Berkeley, Paris -- places more considered and more traditional. As an Angeleno, I grappled with that. "I like these cities, I don't have that here -- what is the issue?" The first thing I did was to move back here in 1982. I was 24 years old, I drew an ellipse on the map. It included downtown, Sunset Boulevard, Olympic Boulevard, and the beach. Anything else was Philadelphia. This elipse was town. I got around on foot and bus inside the ellipse. I had no car for three and a half years. I didn't know anyone else who rode around on a bike, nor did I see bicyclists. I spent a lot of time looking and watching. LA is a really interesting city if you start approaching it in that kind of detail. Walking changes your whole perspective. Back then, people told me I was insane. " You don't have a car??" Things have changed, and now that is seen as so cool. But back then I couldn't get a date. I was a middle-class college grad with a job and no car. It was weird. Immigrants, the poor, the young, that's who rode buses. But LA worked for me as a pedestrian. If I missed the La Brea bus it would be an hour until the next bus, but I could walk from Sunset to Melrose, and it would only take 30 minutes. You won a Durfee grant and used it to study how Ciclovia helped turn Bogota from a crime-ridden city to a place where people felt proud. A city planner working on a river festival for LA suggested I see Ciclovia. In 1974 in Bogota, every Sunday 80 miles of streets were repurposed. One to two million people came. 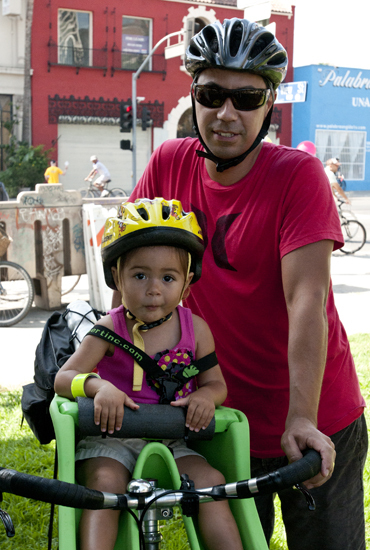 Ciclovia was their contribution, to be so simple and take over city streets -- they belong to us!! I thought, "This is genius -- take over the streets! We don't need a specific public space, we can repurpose any street." Q: How did you get people to support this idea? A: Through working together, thinking about the political and neighborhood and community support we would need. We started contacting every community group, neighborhood council, and business improvement zone. After about six months somebody connected in City Hall set up a meeting in the mayor's office. Mayor Villaraigosa said, "Let's do this, we're behind you. We'll pay for the costs of the streets, the police, and fire department, and you figure out your side." Then putting the festival together became like cutting through butter. All the city departments came to us and said, "This is genius, we will bring our families next time." ariellbphoto.com ...We will bring our families next time! Q: What were some of the obstacles? A: At first no one from the city side could visualize how the event would work, asking, "Where do people start?" "Wherever they want." "Register?" "You don't need to register." No one could imagine what it would look like. "How will people know which way to go?" "They will figure it out." Q: With so much freedom, has safety been an issue? A: We had to figure out street crossings and cross traffic at major intersections. It was not like during the Marathon. We have eight people in uniform at every intersection, four police and four traffic officers; that is our system for soft closures. Although we expect families will stay together, at the second CicLAvia, a father and his two daughters, ages 7 and 9, were at the top of the route in East Hollywood and were going to go back to Boyle Heights. The father couldn't find his 7-year-old. He contacted police in a panic. Uniformed police are all along the route, saying, "We're sure she hasn't gone far." We put out a call and found her in ten minutes. She had gone over the bridge all the way to Boyle Heights, thinking her family was right behind her, having fun. The whole idea is that a seven year old can navigate the city. We can allow kids to own the streets. ariellbphoto.com We can allow kids to own the streets. Q: How have you seen LA change over the years? A: LA has gotten better and better, I am so excited about living here, watching it change. The density adds to diversity. You can viscerally feel it. The city has changed from 80% white to 30% white. People from all over the world come. This is an immigrant city with amazing communities. It's more accessible, we have made huge strides with crime, racial tensions, and economic inequities. It's a much more exciting place. I like to leave my car, walk, take the subway, get out and explore Chinese places in San Gabriel Valley or in the crazy mini-malls that have replaced the gas stations on the corners. Because of the traffic, neighborhoods have had to revive, people can't leave at rush hour, so neighborhoods have had to open up. People want local services and businesses. I grew up in the San Fernando Valley, and restaurants and shopping were few and far between. Density has changed the composition of the city. Now there is diversity in every mini mall at every corner. Strip malls were so derided in the 80's, but they have become incubators for immigrant businesses. A small Armenian deli, Thai coffee donut, a Subway, Korean-run laundromat, and a mani-pedi place can coexist in one tiny, tiny mini-mall. That's a lot of services, where there used to just be just a service station to pump gas. Today neighborhoods might have visual and performing arts, sports, culinary arts, farmer's markets, subways, trains and buses, bikes, and skateboarding. Urban skateboarding was born here and has transformed the place -- now every surface is a place you can skate on -- it's not a staircase, it's a skateboard ramp! When we were growing up there were places you would not go -- we felt trepidation crossing the river, going into Boyle Heights, east LA, Watts. Each of us had our neighborhood, and it was much more difficult to cross lines. There were more gangs and fears about going into other neighborhoods. The fear of the unknown was bigger. That fear has been torn down, bit by bit, brick by brick. Now we can go to San Pedro, Wilmington, Watts -- every place is open, no place is off limits, "Oh you can't go there." Growing up in the 60s that's how it felt, that were places you wouldn't go, without that even being articulated. It wouldn't even come up. Now you sense, "Let's go check that out," and everything has a sense of freedom, and that was huge change. I look at a map of LA. It's a vast place, I've never been there, let's check it out. I realized I had never been to downtown Whittier, "What is it like to drive there not on the freeway -- what does Cudahy, Bell, Bell Gardens look like? "You could do that before, but you wouldn't. People were way more segregated. It was the same experience for an African-American child in Watts. Q: What should we tell children about appreciating the whole city? A: The most important thing for kids in LA is to know how to use their own city. When I do a tour with kids, it opens their eyes to its grandeur. Most of the time, kids are in their own world, whatever their world is -- Chicano culture, Boyle Heights, white middle-class culture. Kids know their own house and neighborhood and mall. They have only the most vague notion of other great places to go in LA besides theme parks, the beach, the Grove. The addresses in their vocabularies are limited. They have no idea that they can get around without a car, that there are amazing historic neighborhoods downtown, and all the history and layers. Q: What skills do children need? A: It's important to be a really good listener, to understand how people around you are reacting, and their issues and needs. You will need other people no matter what you want to do, you will need to work with and learn from other people. Figure out what you are good at, and do it. At camp I was the organizer. I wasn't the visionary, I was the one who figured out what skit we've got to put on... these are the same skills I am using in the work I am doing now. ariellbphoto.com The fear has been torn down, bit by bit, brick by brick. A: My parents were huge influences. My dad had a deep appreciation of architecture and the city, for people telling stories. Mom helped me believe in myself and make things happen. "Let's put on a show!" Mom used to be drama director of the drama club at the Jewish Community Center. Q: What are the costs and how much are you able to raise? A: The costs to the city are a quarter of a million dollars each time, or more. We have our office, salaries, people on the ground, months of work -- making sure churches have a parking lot for the day because we have blocked neighborhoods and apartment buildings, languages to tell people of LA about it, do we have t-shirts and messaging, food, what to do along the way, amenities. We need to stay fresh so people will want to come, still have the excitement and wonder. We want to make the event regular enough so little kids can grow up thinking that every month they get to own the street. 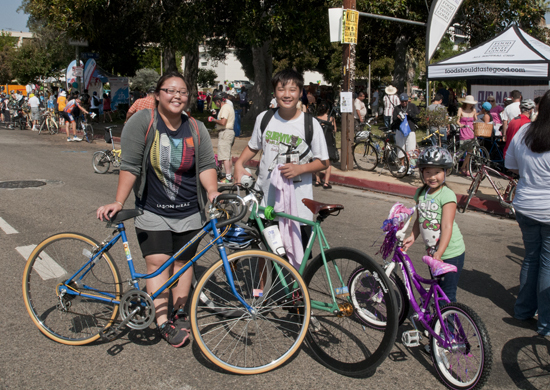 Little kids shouldn't have to wait a year for the next CicLAvia.